December 04, 2018 at 1:01 am. The magic number against the Washington Redskins was 17, and the Philadelphia Eagles took a big step toward hitting it when they scored a touchdown on their first drive of the game. It had been more than a month since the Eagles scored a first-quarter touchdown, but this one helped catapult them to a 28-13 win over the Redskins at Lincoln Financial Field on Monday night. Washington is now 0-6 when they allow an opponent to score 17 or more on them. In another statistical oddity, the team that had scored first in every Washington game this season had gone on to win. The Eagles did both, establishing an early rhythm, marching 75 yards on 12 plays that spanned 7 minutes, 29 seconds, finishing off the drive with a six-yard touchdown throw from Carson Wentz to Golden Tate to take a 7-0 lead. They had scored just 21 points in the first quarter all year and had gone five straight games without a point in the opening first quarter. 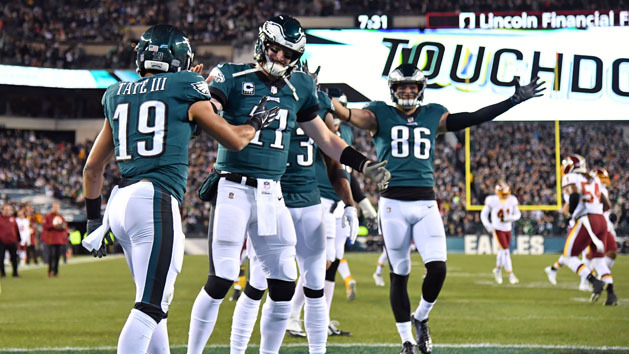 “That was huge,” said Jordan Matthews, who caught a four-yard touchdown pass early in the fourth quarter to give the Eagles some breathing room and 20-13 that became 22-13 when Tate made a nice catch of a low pass from Carson Wentz to complete the two-point conversion. Incidentally, the Eagles are now five-for-five on two-point tries this year. As for Tate, it was his first touchdown as an Eagle since being acquired at the trade deadline, a month ago. He had his best day with his new team, finishing with seven catches for 85 yards. Wentz was 5-for-5 on the opening drive for 48 yards and ended his night 27-for-39 for 306 yards, two touchdowns and one interception. In 10 games this season, the quarterback has thrown 18 touchdowns and seven picks. Speaking of quarterbacks, Washington lost its second one to a broken leg in two weeks. Colt McCoy, who took over when Alex Smith broke his leg on Nov. 18, broke his leg in the first quarter on Monday night. The Redskins, now losers of three in a row to drop to 6-6, had to turn to Mark Sanchez, who hadn’t played an NFL game since the 2016 season when he got into three games with the Dallas Cowboys, making two starts. Sanchez made 10 starts for the Eagles over two seasons, 2014 and 2015. “This is a tough blow,” said Redskins head coach Jay Gruden. “Losing Alex was one thing. He was a great leader, great quarterback, put a lot of time in with him. On the first play that Sanchez took over he handed the ball to Adrian Peterson, who raced 90 yards for a touchdown to give the Redskins a 10-7 lead with 9:23 to go in the second quarter. It was the longest run of Peterson’s career and it was the longest run from scrimmage against an Eagles defense since 1960, when Pittsburgh Steelers back John Henry Johnson went 87 yards. “We have to look at that run on film and see what happened with that,” said cornerback Rasul Douglas, who led the Eagles with seven tackles. “I know I just turned around, looked, and he’s just running, hitting his head on the pylon. Even with Peterson’s 90-yard run, the Redskins could do little against the Eagles defense, which got sacks from Fletcher Cox, Malcolm Jenkins, and Brandon Graham and held the visitors to just 235 yards of offense and two-for-10 on third down tries. 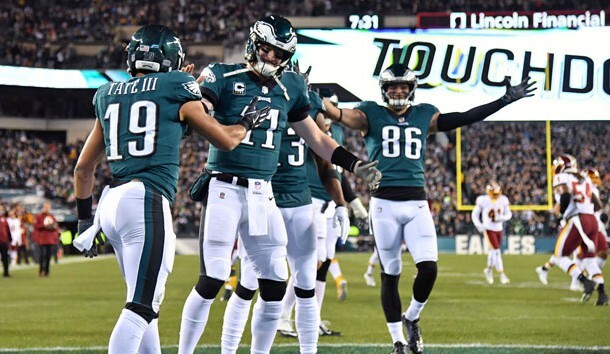 Sanchez was 13-for-21 for 100 yards and was intercepted by linebacker Nate Gerry, which set up a Jake Elliott field goal from 46 yards away to give the Eagles a 25-13 lead with 11:41 left in the fourth quarter. Undrafted rookie free agent running back Josh Adams broke his career-high in rushing yards set in last week’s win over the New York Giants. He ended with 85 yards against the Redskins, one more than he had against the Giants. It was Adams’ second straight week with at least 20 carries. He had 22 against New York and 20 against Washington. Winners of two straight for the first time this season, the Eagles are now 6-6 and will travel to Dallas on Sunday to play the 7-5 Cowboys with first place in the NFC East on the line. They will do so with running back Darren Sproles healthy again and their record-setting tight end Zach Ertz. Playing his first game since the season opener on Sept. 6, Sproles scored his first rushing touchdown since December of 2016 when he went 14 yards for a score with 1:46 left in the opening half that gave the Eagles a 14-10 lead that they would never surrender. Ertz had nine catches for 83 yards and now has 93 receptions for 978 yards. On the Eagles’ touchdown drive that made the score 22-13 early in the fourth quarter, Ertz caught his 91st pass of the season, which broke the record of 90 set the Eagles’ record for most receptions in a season set by running back Brian Westbrook in 2007. He is on track to become just the third tight end in NFL history with at least 100 catches.